Thermatex line ... promotes well-being. 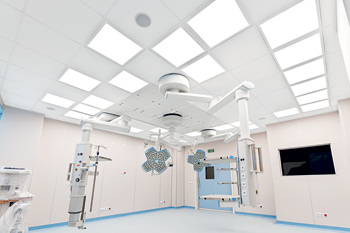 KNAUF AMF, a leading European manufacturer of high-quality ceiling systems, has introduced its Thermatex medical range in the Gulf region. The medical range was launched in response to the need to maintain high health and hygienic standards at healthcare facilities especially in specific rooms and their ceilings, says Sreejith Panicker, Knauf AMF’s regional manager for the GCC region. A technology leader in multi-functional ceiling systems, Knauf AMF’s product line address the requirements for fire protection, acoustics, hygiene, and design. According to Panicker, in-room acoustics are often given less consideration but are equally important for good building design as well as patient and occupant comfort. “Due to this need for individual solutions, we have developed the Thermatex medical range. 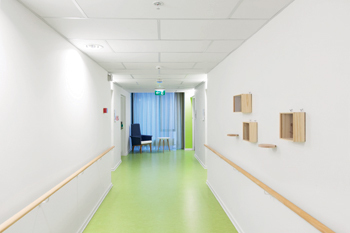 The range not only fulfils the stringent hygiene requirements of the healthcare sector but also the high demands for fire protection and acoustic requirements. At the same time, the range offers a uniform aesthetic for every room, regardless of the performance requirements, he says. The medical range is currently being introduced to the designers in the region.